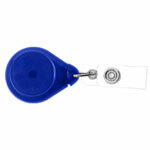 Reel, Badge Reel, Round, Plastic, Belt Clip-On, Translucent Royal Blue, 1 1/4", Clear Vinyl Strap. Sold in quantities of 25. Priced per 25 units. Reel, Badge Reel, Round, Plastic, Belt Clip-On, Translucent Green, 1 1/4", Clear Vinyl Strap. Sold in quantities of 25. Priced per 25 units. Swivel Reels, Badge Reel, White, Heart Shape, with Swivel Back. Quantity of 25. Heavy Duty Reels, Heavy Duty Reel Which Extends 48" and Holds Up to 25 Keys. Priced per unit. Max Label Reels, White Max Label Reel with Larger Imprint Area for Custom Logo. Fits All Slotted Cards. Quantity of 25. Carabiner Reels, Carabiner Reel with Standard Strap End - Blue. Sold in quantities of 25. Priced per 25 units. Carabiner Reels, Carabiner Reel with Standard Strap End-Black. Sold in quantities of 25. Priced per 25 units. 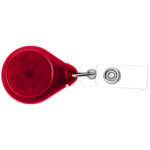 Premium Reels, Premium Translucent Badge Reel with Vinyl Strap and Swivel Clip. Quantity of 25. Premium Reels, Premium Translucent Badge Reel with Vinyl Strap and Swivel Clip. Sold in quantities of 25. Priced per 25 units. 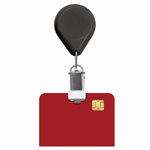 Premium Reels, Black Premium Badge Reel with a Twist Free Design and Card Clamp End Fitting that Eliminates the Need to Slot Id Cards. Quantity of 25. 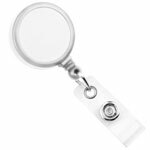 Premium Reels, White Durable Badge Reel Has a Twist Free Design and Strap End Fitting that Holds Slotted Cards. Quantity of 25. Premium Reels, Premium Badge Reel with Vinyl Strap and Swivel Clip. Sold in quantities of 25. Priced per 25 units. 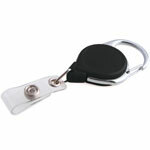 Premium Reels, Black Durable Badge Reel Has a Twist Free Design and Strap End Fitting that Holds Slotted Cards. Quantity of 25. Premium Reels, Premium Translucent Badge Reel with Vinyl Strap and Slide Clip. Quantity of 25.